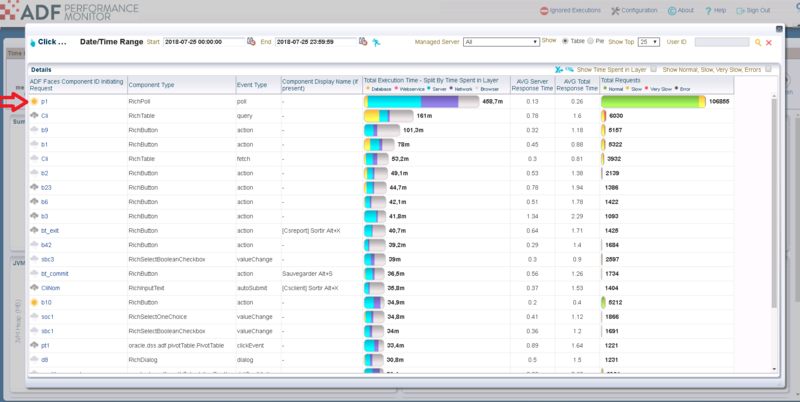 Last week I was doing an extensive performance analysis / health check on a large ADF project, with the newest version of our ADF Performance Monitor product. In this performance assessment/analysis I have focused high-level on the most important performance bottlenecks. We could see in the ADF Performance Monitor that end-users experience very slow page load times, they were waiting much more than needed. This ADF application needed attention; it could run more efficient like nearly all ADF applications can. In this blog I describe some of my findings, maybe interesting for other ADF projects as well. What already is strange here is that the AVG total time end-users needs to wait (0,57 Sec) is more than double the time the AVG process time by the application server (0,25 Sec)! On the chart at the right bottom we can see the explanation for this. In this chart we see in a glance in which layer processing time has been spent; database (yellow), webservice (pink), application server (blue), network (purple), and browser load time (grey). Read more on adfpm.com – our new website on the ADF Performance Monitor. Frank Houweling is an Oracle ADF, Java and performance specialist. During the past years he has been requested several times as troubleshooter of ADF projects with bad performance. As such he has been performing performance analysis, bottleneck detection and developing mitigating solutions based on these analysis. He is also the creator of the ADF Performance Monitor, an advanced monitor that can identify, report and help solve performance bottlenecks in ADF applications.